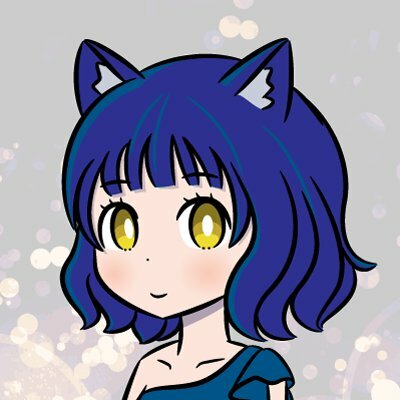 Mona party (common name: Monapa) Twitter bot to assist in distributing tokens. The author of this article, the author of Monapa, will not take any responsibility. ③ I give the token to the person who specified it. ④ Distribute tokens to applicants (first-come-first-served basis). 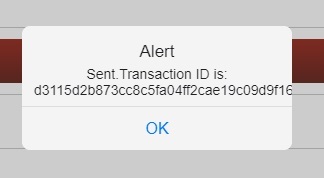 Assumption: Explanation using multi-wallet “Monya”. Registration and setting of Monacard. 1.When you are ready, move to Monapa-chan portal. 2.Twitter authentication on the top screen. 3.After login, the screen as shown below is displayed. 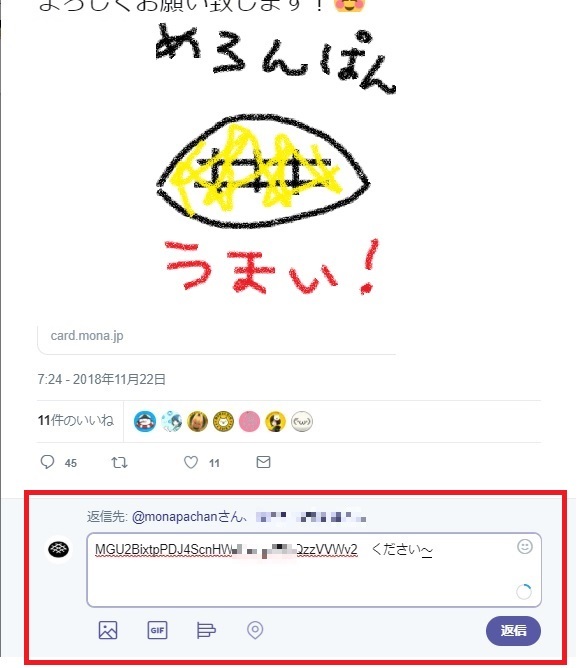 * You can select [token under distribution] [Mona Card Gacha] [possession token] by menu switching. 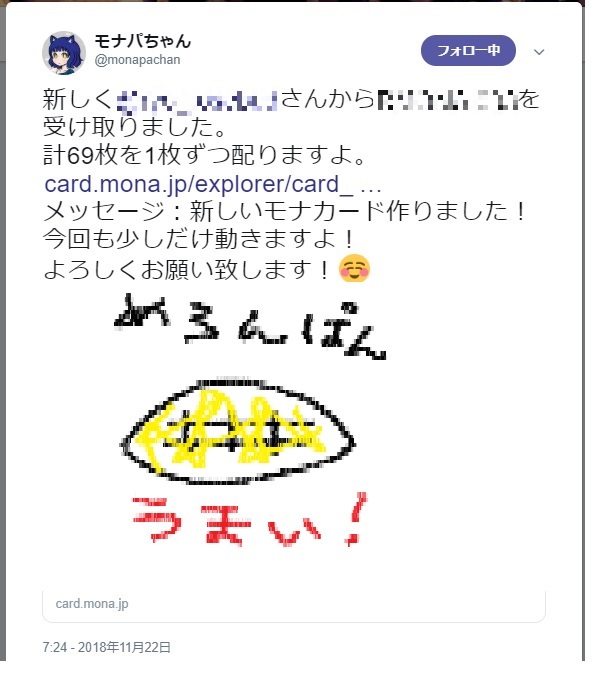 1.Find tweets of cards I want from Monapa-chan ‘s Tweet. If distribution has been completed, the distribution end tweets under the tweet of 1. 3.After a few minutes, I will reach the Monapa-chan portal. * In some cases, it may reach directly to the card list of “Monya”. 4.In order to extract the received token, put ☑ in the upper right of each token, enter the destination monaper address, and press 【Draw out all selected tokens】. * In some cases, in some cases, it may arrive directly to the card list of “Monya”. 5.The following drawer tweet is displayed. Please tweet. Write Twitter ID in memo. Send it with “Monya” using these two. 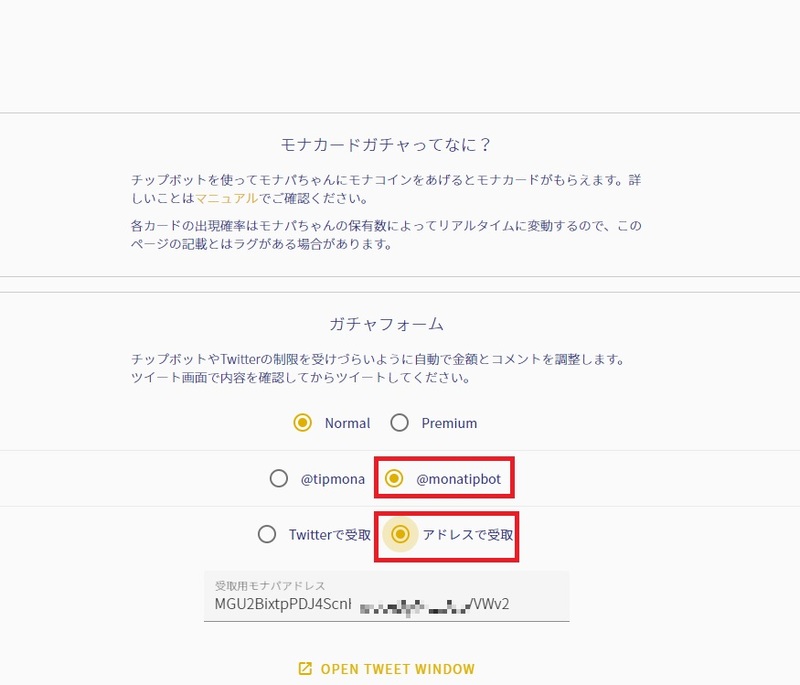 1.Select “Play with card” from the menu “Monya”, select the token to deposit, and click “Send”. 2.Enter the necessary information as below. D … Do not check. 3.This screen is displayed and transmission completed. 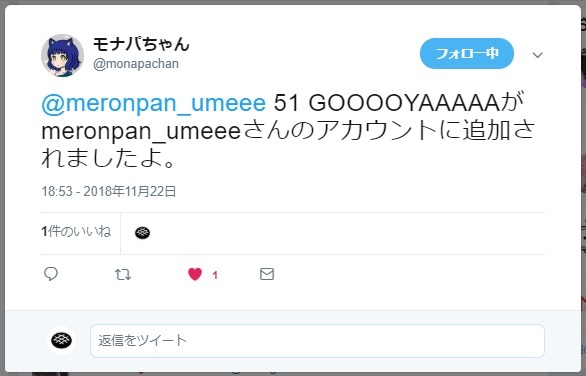 4.After a few minutes, such a tweet is done from Monapa-chan. ③ Increase the token to a specific person. * Keeping tokens in advance in Monapa-chan. ④Distribute tokens to applicants (first-come-first-served basis). *Keeping tokens in advance in Monapa-chan. *Monapa-chan will draw a distribution amount for one person. *Maximum number of people to distribute is 300 people. Use tipbot (@tipmona or @monatipbot). By paying MONA you get a normal or premium token that Monapa-chan has. * Note the balance of tipbot to pay. 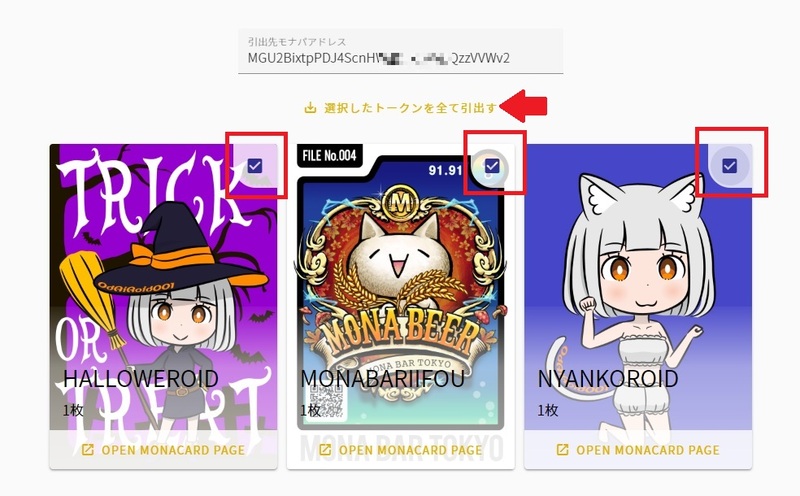 1.Select 【Mona Card Gacha】 from the menu change of Monapa chan portal. 2.The following screen is displayed. 3.Choose the type of gacha, the type of tipbot for payment, and how to receive it. In case of receipt by address, the address will be displayed automatically. 4.Press [OPEN TWEET WINDOW] to automatically switch to tweet screen. Tweet as it is. 5.After a few minutes, the results of Gacha are tweeted from Monapa-chan. 6.The token that won the prize is added to Monya’s【Play with card】. In addition, the normal premium can gacha up to ten consecutive times. Since consecutive gacha correspond only to Twitter receipt, do not write receipt address. After Gacha, draw out from Monapa-chan portal.